Knee dislocations are devastating injuries and besides causing multiple ligament disruption are often associated with neurovascular deficit and soft tissue trauma. The complexity of presentation and spectrum of treatment options makes these injuries unique and extremely challenging to even the most experienced knee surgeons. An astute appreciation of the treatment algorithm is essential to plan individualized management since no two complex knee dislocations are ever the same. Moreover, attention to detail and finesse of surgical technique are required in order to obtain good functional outcomes. 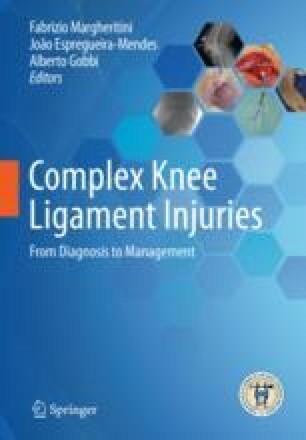 Over the past 10 years, our service has prospectively analyzed 93 knee dislocations, and this experience forms the basis for the treatment algorithm proposed in this chapter.